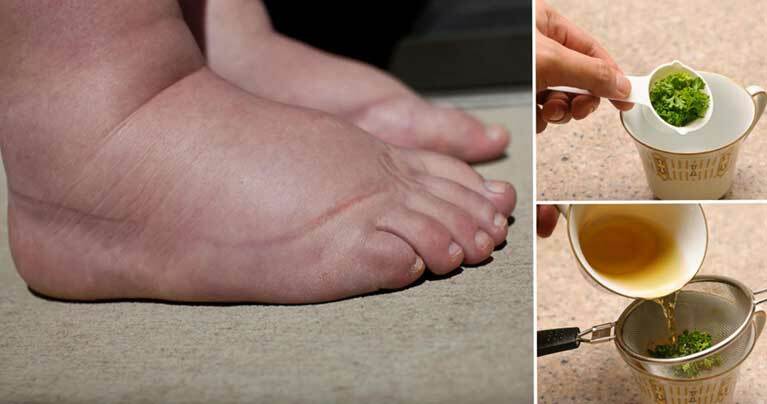 Water retention often causes pain due to swellings in the feet and torso, and if you have experienced this, then you know that it is highly uncomfortable and painful issue. Water retention is known as edema in medicine and is actually the accumulation of excessive fluids in the body due to various reasons, and we will suggest ten natural remedies to resolve it and reduce the swelling it causes, usually in the torso, feet, and legs. These swellings are painful, and edema might also lead to stiff joint, high blood pressure and pulse, and weight gain. This condition might be a result of medications, physical inactivity, excessive intake of salt, vitamin deficiencies, contraceptives, as well as environmental conditions, like high weather temperatures and altitudes. Water retention might occur due to internal factors, such as poor circulation, thyroid issues, vein and liver disorders, allergies, pregnancy, high blood pressure, stress, dehydration, and heart and kidney problems. It is one of the most powerful water retention natural remedies. You should add a few teaspoons of dried parsley in a cup of water, and boil. Then, leave it to cool for 10 minutes and drink this tea three times daily. You can also add some lemon juice to the tea for even better effects. Apple cider vinegar is abundant in, which lowers the sodium levels in the body. As you already know, sodium retains water in the body, so vinegar is excellent in this case. Just add a teaspoon into a glass of water, and drink the remedy twice daily. You can boost the effectiveness of the drink if you add an extra tablespoon of apple cider vinegar per glass. You can also soak the feet in a hot bath with vinegar for 10 minutes. This will soothe the swellings and also treat bad foot odor. This juice accelerates the production of urine in the organism and is high in calcium, potassium, and magnesium. You should drink a cup of unsweetened cranberry juice daily, or you can take cranberries in pill form. Researchers have found that dandelion supports the urine production in the body. It also lowers the sodium levels, as it is high in potassium. Dandelion is also rich in magnesium which reduces premenstrual bloating. You should add a teaspoon of dried dandelion leaves in a cup of warm water, boil for about 10 minutes, strain, and drink the tea several times daily. You can also use dandelion pills, but make sure you consult your doctor before you take them or start consuming the tea, as dandelion might interfere with certain drugs. Onions purify the blood and stimulate the urine production, thus preventing kidney stones. Peel a few onions, add them to 4 cups of water and boil. Add some salt, and drink this remedy three times daily for a few days. This potent diuretic increases the production of urine in the body and supports the ability of the kidneys to process more water and sodium. It prevents toxic buildups in the body and helps digestion. You should add a teaspoon of fennel seeds in some hot water and boil it. Then, cover the cup and leave it to cool for 10 minutes, strain, and consume this three times daily. An Epsom salt bath reduces the bloating of the tummy, as well as water retention issues, through a process known as reverse osmosis. This process involves removal of all excess fluids in the body, as well as toxins. The bath is relaxing, soothing, and calming. All you need to do to enjoy these benefits is to add two cups of Epsom salt in a warm bath and soak in it for 15 minutes. Repeat three times a week. It efficiently stimulates the urine production and helps in the case of water retention. Just add a teaspoon of nettle root in a cup of warm water, leave it for 10 minutes to cool down, and drink several times daily. Lemon juice eliminates the excessive fluids from the body, as well as the accumulated waste and toxins. Just add a few of tablespoons of lemon juice in a cup of warm water. You can sweeten with honey. Drink this remedy on a daily basis for several days. Essential oils can be of great help in the case of water retention. Aromatherapy stimulates the drainage of fluids by triggering the lymphatic system. Add 20 drops of your favorite essential oil to a hot bath and soak in it for 10 minutes, three times a week. For best effects, we recommend geranium, cypress, and juniper essential oils. In case you face water retention issues, we suggest consuming more diuretic foods, such as celery, cucumbers, cabbage, watermelon, bananas, pineapples, and watercress, as they also boost the production of urine. Moreover, make sure you drink a lot of water to prevent dehydration, exercise regularly, and limit the intake of alcohol and salt.